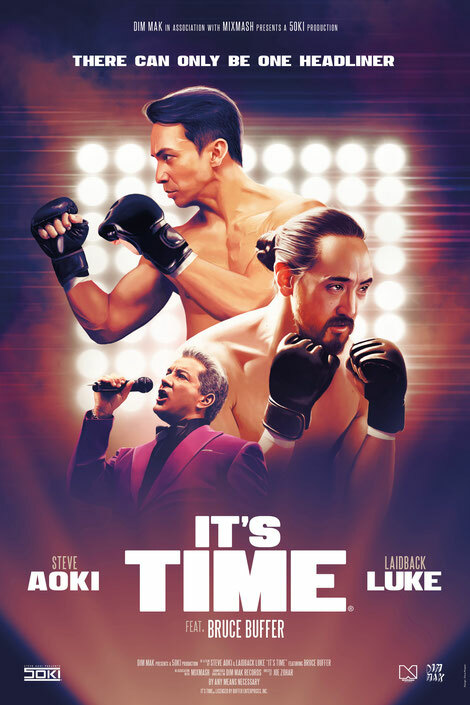 Steve Aoki and longtime friend Laidback Luke provide the follow up to their collaboration ‘Turbulence’ with ‘It’s Time’, premiered on Men's Health. This fight-themed electro house track sees Steve battling Luke for world supremacy, with UFC announcer Bruce Buffer on board to provide his signature tagline. The track is the third single from Aoki’s ‘5OKI’ campaign, which consists of five collaborative singles and music videos, all coming out over five consecutive weeks on Dim Mak, each track marking a return to his favoured big room, electro house sound. Featuring work by digital painter Flore Maquin, the single’s cover art mirrors a movie poster, keeping in the same vein as the theatrically-inspired music videos. The official music video pits the two against each another as mixed martial art fighters prepping for the fight of a lifetime. Bruce is also featured in the video. Filmed on location at the UFC’s Performance Institute in Las Vegas, the video features intense scenes of both fighters preparing for the bout, with Aoki being trained by UFC Hall of Famer Ken Shamrock and Laidback Luke showing off his real life Kung Fu skills. The track cements the long-standing friendship between Aoki and Luke and is their first collaboration since the release of 2011’s ‘Turbulence’.